For years, I have heard this nutritional “rule of thumb” and subsequently believed it myself: breakfast really is the most important meal of the day, and it has never been thought of as a good idea to skip it. Despite this very good advice, previous research has shown that up to 20% of Americans regularly do not bother to eat a proper breakfast or anything at all to start their day. Recently, some new research published last week in the journal Circulation has brought new meaning to the importance of eating breakfast. The large observational study followed 27,000 male health professionals aged 45-82 living in the U.S. The study analyzed the diets and health outcomes, including the development of heart disease or heart attack in this group of men. The group was followed from 1992-2008 during which time there were 1,572 cases of documented heart disease. The results of this study indicated that the men who regularly skipped breakfast had a 27% increased risk of developing heart disease compared to men who regularly ate breakfast. “Men who skip breakfast are more likely to gain weight, to develop diabetes, to have hypertension and to have high cholesterol,” said lead author of the study Eric Rimm. The study also discovered that men who regularly indulged in late night snacking had a 55% increased risk of developing heart disease compared to other men who did not. This really shows you that breakfast is really the most important meal of the day. In looking at this study, it’s important to also consider the following information which could explain the findings with greater clarity. Men who regularly skipped breakfast tended to be younger, working full time, and may have had stressful jobs which did not allow them the opportunity to eat a regular breakfast. We all know how chronic stress can affect heart health over an extended period of time. The men who had the highest risk of heart disease because they skipped breakfast were also more likely to have a lifestyle which could be deemed to be unhealthy. For example, they were more likely to be smokers, be sedentary, and drink alcohol. This could obviously account for the trends toward heart disease over time. These men were also more likely to eat more calories in fewer meals later in the day. This may imply that the food selections they made were also intrinsically unhealthy, subsequently increasing their risk of heart disease. After the researchers made adjustments for body weight, diabetes, cholesterol, and hypertension, the overall risk of developing heart disease associated with skipping breakfast was lowered to 18%. However, it’s still quite high. 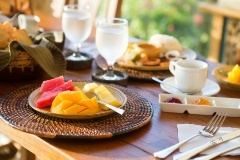 “People who skip breakfast have higher levels of fasting insulin, triglycerides, and LDL cholesterol,” said Rimm. In my opinion, this is the reason why we see this type of result in this group of men. They all had developed various forms of metabolic syndrome by the time the study ended. This could account for the differences in cardiovascular risk. More importantly, the overall risk of developing heart disease was mostly seen in the middle-aged men. Men between the ages of 45-60 who skipped breakfast showed a 50% increase in the development of heart disease compared to those who ate breakfast. In men over the age of 60, there was no associated difference in the risk of heart disease and skipping breakfast. This group of older men was less likely to work full time in stressful jobs which may have accounted for the lack of associated risk. The take home message from this study is that breakfast is indeed the most important meal of the day! Busko, M., “Skipping Breakfast Ups Risk of CHD in Middle-Aged Men,” http://www.medscape.com/viewarticle/808257?nlid=32149_1885&src=wnl_edit_dail, last accessed July 30, 2013. “Skipping breakfast a recipe for heart disease, study finds,” Medline Plus web site, July 22, 2013; http://www.nlm.nih.gov/medlineplus/news/fullstory_138936.html, last accessed July 30, 2013.